It’s a beautiful day. Barack and Michelle Obama had lunch with U2 frontman Bono at NYC restaurant Stephen Starr’s Upland on Friday, March 10. The former first couple looked fashionable and relaxed as they exited the eatery with the 56-year-old music icon, with Barack, 55, in a sharp suit with a crisp white shirt — sans tie! — and Michelle, 53, in a cool gray coat and black-and-white shirt. Videos posted by fellow diners show that the couple left the Park Avenue restaurant to cheers and applause from the room. The former president can be seen smiling and waving at people as he makes his way outside. A source told Us Weekly that the group ordered the fried chicken sandwich, the sausage and kale pizza, and the bucatini cacio e pepe. They sat downstairs in the restaurant’s private dining room. 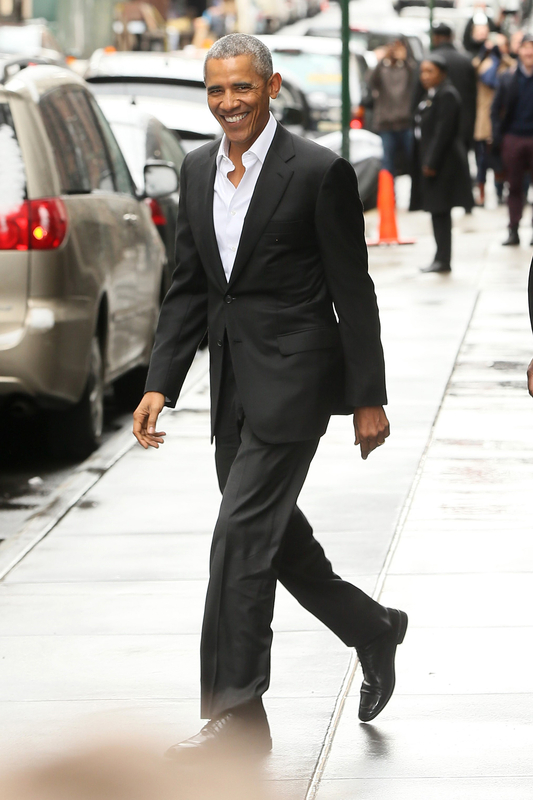 The former POTUS has been spotted in NYC on multiple occasions since he left office; just last month, he and daughter Malia attended The Price on Broadway, sneaking into the theater after the lights went down and ducking backstage to meet the cast during intermission. Earlier in the day, prior to the play, he caused a sensation when he popped by a Starbucks in NYC’s Flatiron district. Crowds gathered and cheered as he exited the building with a wave and a coffee in hand. Michelle, meanwhile, has been staying busy with projects and passions. On Wednesday, March 8, the former first lady surprised 12 “fierce and promising” girls at a school in Washington, D.C. in honor of International Women’s Day.